C625-HW: 5/8" - 11 (package of 6) *Includes install tooling and cutting fluid. The C-Sert System The patented C-Sert system gives you quick and permanent repair of damaged threads, and prevents damage to OEM threads. C-Serts' main characteristics are: 1) Self-tapping C-Serts require no tap because they are a tap. 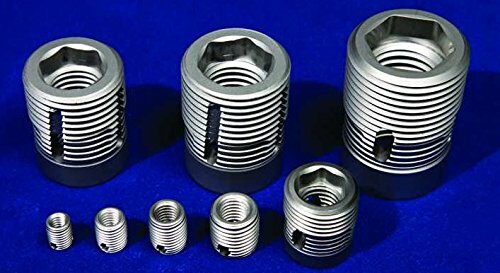 You can think of them as a precision cutting tool that you use just once, and that ends up staying in the part to provide you with new, permanent threads. 2) Self-aligning C-Serts automatically align themselves to the axis of the hole, so they always go in straight. 3) Low-torque Installation Because they are taps, C-Serts have cutting teeth with chip relief. Chip relief reduces the torque needed to install them, so that even the largest C-Sert can be driven in with hand tools or medium-duty impact wrenches. 4) High Hardness C-Serts have a Rockwell hardness of 56RC, far harder than the toughest fastener. This means that a C-Sert's threads cannot be damaged by cross-threading or over-torqueing 5) Left-handed External Threads A C-Sert's external cutting threads are left-handed. When a frozen bolt needs to be broken free from a C-Sert, this patented feature prevents the insert from backing out €" instead, the C-Sert digs even tighter into the base metal until the bolt breaks free. These features combine to produce a thread-repair insert that lasts the life of the equipment, and will not back out, pull out, wear out, or vibrate free. And C-Serts can be field installed without tapping or welding, with the absolute minimum of downtime.